Screenshot Captor, Screen Capture Download. Screenshot Captor is a program that lets you take screenshots of the entire screen or part thereof; whether a section of a web page interface of a program, or any other source. It also serves to create tutorials or manuals of programs because the catches can be detailing the steps, and you can add text to them better documentation. This program has several advantages and extra features compared to other similar programs, or about the simple process of pressing the Print Screen key. It has several capture modes: active window (even if minimized), by region of the screen, the entire desktop, and so on. Each mode has an associated key to take the catch easily. If the catch extends the boundaries of the screen like making and reduced. It has shortcuts to upload photos captured image hosting sites. The possibilities that this software does not end with the capture, but also offers the possibility of editing the captured images. The editing functions are basic but useful, for example, resizing, rotation, cropping (with the option to apply effects cutting edges), add watermarks, add frames, etcetera. You have the option to select another default photo editor, that run automatically when trying to edit a capture. Has a feature that allows you to capture photos from the web camera connected to the PC, and is even able to capture video from webcam, requiring the ESR add on to accomplish that task. A new feature lets you capture windows semitransparent own "glass" effect of Windows 7. Another new tool to correct and edit scanned images, supporting a wide range of devices. 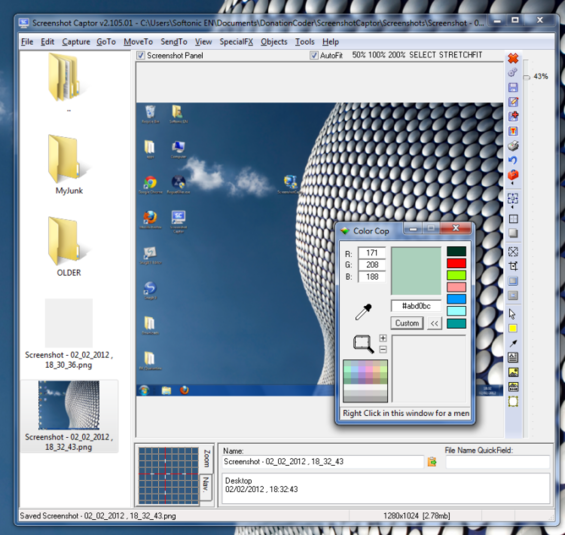 Screenshot Captor 4.9.1 is the latest (updated October 2014) version of this screen grabber that can be downloaded for free. Works with Windows 98, 2000, XP, Vista, 7 and Windows 8.